Be the first to share your favorite memory, photo or story of Dr. Willie. This memorial page is dedicated for family, friends and future generations to celebrate the life of their loved one. 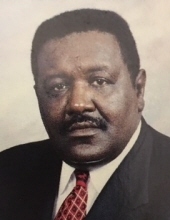 Dr. Willie D. Acklin, 68, of North Little Rock, AR passed away peacefully on Sunday, April 14, 2019. He was born in Mayflower, Ar on November 21, 1950 to the late Deacon L.C. and Ethel Acklin. He is preceded in death by his parents L.C. and Ethel Acklin; sister Mae Beard and brother Herman Ray Acklin. Dr. Acklin leaves to cherish his memories his wife Rita Acklin; son Deon Acklin; grandchildren Deon II, Jacob and Peytan Acklin; brothers Larry (Ernestine) and Bobby (Pamela) Acklin and sisters Shirley Hardge and Madelyn (Oscar) Wilbon. Funeral services will be held 2:30 pm, Saturday, April 20, 2019 at Rock of Ages Missionary Baptist Church, 8112 Bicentennial Road, North Little Rock, AR. Visitation 3:00 pm - 7:00 pm, Friday, April 19, 2019 at Samaritan Hill Missionary Baptist Church, 1001 East 13th Street, North Little Rock, AR. Interment 12 noon, Monday, April 22, 2019 at the Ar State Veterans Cemetery, 1501 W. Maryland Avenue, North Little Rock, Ar. Services entrusted to Larry G. Acklin Funeral Home, 8821 Colonel Glenn, Little Rock, Ar. "IN YOUR TIME OF NEED....WE CARE." To send flowers or a remembrance gift to the family of Dr. Willie D. Acklin, please visit our Tribute Store. "Email Address" would like to share the life celebration of Dr. Willie D. Acklin. Click on the "link" to go to share a favorite memory or leave a condolence message for the family.